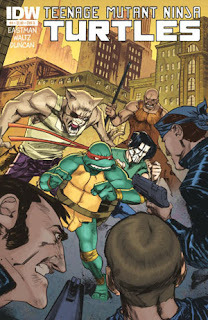 When last we left our intrepid turtles, Raphael and Casey Jones had fallen into the clutches of the evil Old Hob, while the other three Heroes in a Half Shell combed the city looking for their prodigal brother.There wasn’t much to this issue, a lot of action that led to the four brothers being reunited at last. The action was pretty tight and didn’t feel superfluous. Likewise the flashback sequences lasted just long enough to learn that the lab, Stockgen, that was experimenting on the turtles and Splinter hired Old Hob to hunt them down so they could get an untainted mutagen sample from their blood. April has her obligatory page, even though it’s not really relevant to this issue’s story, where it seems like she’s starting to think maybe Splinter is intelligent. The real twist of this one is the flashback that shows Splinter, Leo, Donnie, and Mikey just after their mutation. Splinter is talking to them and is dropping phrases like, “Fate and Destiny have provided for our reunion” and “There is much you don’t recall, all of you.” And the most foreshadowing of them all “…There are many things I must teach you- many things for you to learn once again”. WHAT?! Again? Alternate universe? Space time warping? What’s going on? So many questions to be answered and now we’re finally getting to some answers. As always the gritty art by Dan Duncan fits perfectly with the tone and story.